Most of these items simply make good, practical sense to us as architects, builders, and professionals who like to keep both feet on the ground. They make so much sense, in fact, that we rarely figure out the mathematics behind the decision to retain and reuse an existing foundation. 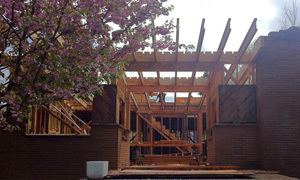 If the foundation was poured in the 1950’s or later, if it’s in good structural shape, and if there is a way to merge the existing foundation with a new design for the home (which there usually is), we move forward into schematic design with confidence (and with an existing foundation). 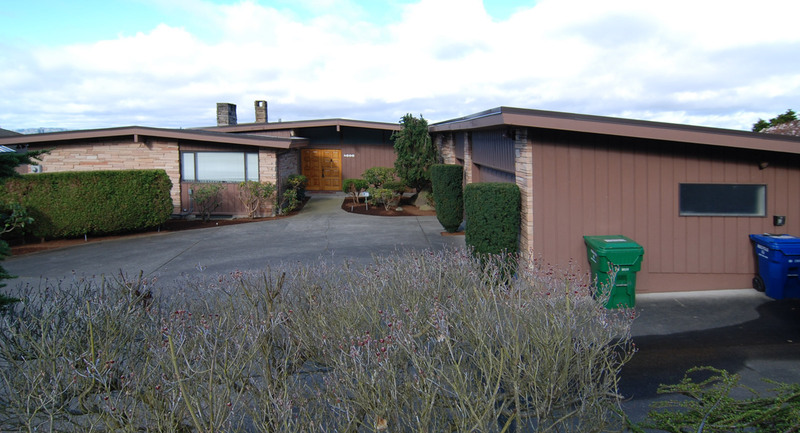 THE EXISTING HOUSE, originally constructed in the 1950’s, has a footprint of 3,529 square feet. It’s a solidly built one-story structure with partial basement, partial crawl-space and partial slab on grade. While the home itself is outdated and in need of modifications, the foundation is in very good shape. 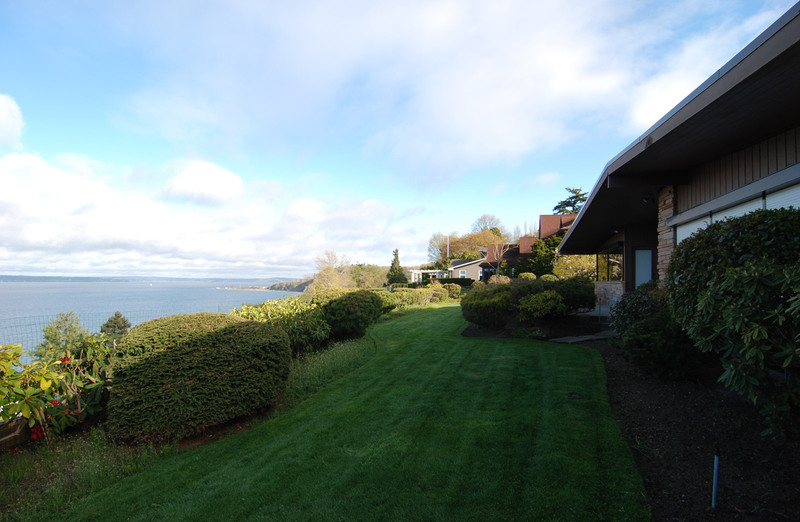 THE SITE is situated on Magnolia bluff, a steep slope zone highly scrutinized by the Seattle building department. The adjacent landscaping is mature and well maintained. The house and surrounding trees show no signs of movement, drainage issues or unusual settling. 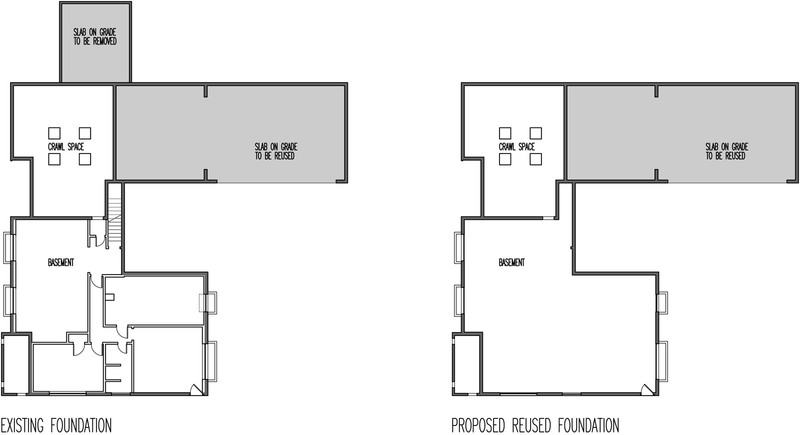 THE PROPOSED DESIGN, will retain all of the existing concrete foundation except a 288 square foot addition which was poorly constructed and doesn’t fit with the house or the site. THE EXISTING FOUNDATION TO REMAIN is equal to the amount of concrete that will not be going to the landfill or the recycling facility; it adds up to 2,035 cubic feet (75.4 cubic yards) or 226,200 lbs (113.1 tons) of concrete. This number includes all of the concrete within the footprint of the home (footings, retaining walls, and slabs on grade). Not trucking this material to the landfill or recycling station saves an estimated 56 gallons of fuel and eliminates a dump truck on the roads for 8 round-trips totaling 384 miles. The elimination of an excavator on site saves an estimated 100 gallons of fuel. THE EXISTING FOUNDATION TO BE DEMOLISHED results in 96 cubic feet (5.8 cubic yards) or 17,400 lbs (8.7 tons) of concrete and is equivalent to one dump truck load. This will likely be crushed and reused on site as fill for the proposed landscaping. THE NEW FOUNDATION THAT WON’T BE NECESSARY (even if it were constructed in the exact footprint of the existing house) would consume more concrete and steel than the existing foundation, simply because today’s building codes and standards are a bit more stringent. The concrete required to build a new house of the same footprint would consume 2,265 cubic feet (83.9 cubic yards) or 251,700 lbs (125.9 tons) of concrete. This concrete work would require 13.4 cubic feet of reinforcing steel. The trucking required of this foundation would require an estimated 21 gallons of fuel with the concrete mixer on the roads for 9 round-trips totaling 100 miles. Once you factor in waiting times, concrete pumping, delivering the reinforcing, etc., the fuel amount would most likely be doubled. THE TOTALS of reusing the existing foundation eliminates over 226,000 lbs of concrete from entering the landfill or recycling facility, it prevents 2,265 cubic feet of concrete and 13.4 cubic feet of steel from being produced/used and saves approximately 200 gallons of fuel, and this is just for the actual material conveyance and placement (more on the other carbon impacts in a moment). Obviously there are some variables involved in this calculation, such as distances to the concrete/landfill/recycling facilities, type of machinery being used, and the efficiency of work on site. But even with a healthy margin of error, these are big numbers for a single family residence. THE LIMITATIONS of our math here are obvious. For instance we don’t address the resources/fuel it would take to put the crushed and recycled concrete back into use once it’s been delivered to the recycling facility. The resources required to produce the new concrete and steel for a new foundation also aren’t addressed. It would be an interesting study to follow the thread further and determine the carbon footprint of reusing the foundation as opposed to demolishing and existing foundation and pouring a new one. But not only is that math a bit beyond our expertise, we’ve got a house to continue designing here. The bottom line is that these fully developed numbers would simply reinforce (pun intended) the environmental significance of keeping an existing foundation. THE COST of all this is perhaps the most important clincher. All of this material and fuel is eliminated, reduced, reused and recycled for the minimal cost of the design team sharpening their pencils and figuring out an elegant and strategic method to reuse a perfectly good foundation. There’s no proprietary technology to acquire, no ironic “green” home gadget to buy, and no esoteric information to decipher. Any design and construction team can do this. THE DISCLAIMER of this method of sustainable design is both encouraging and maybe a bit depressing for some readers. As beneficial to the environment (and frankly, to a project’s target budget and schedule) as reusing a foundation is, it’s never going to sound all that stimulating at a dinner party. The conversation will likely be trumped with talk of “sexier” technologies: solar panels, geothermal heating, gray-water collection tanks, what have you. And while all of these sustainable and “green” technologies have their merits, none beats the energy spent vs. value gained equation of simply reusing an existing foundation. 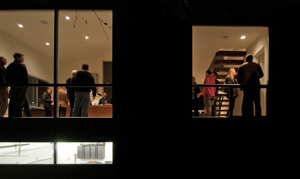 THE POINT of all this was to take our best crack at the sustainability metrics of reusing an existing foundation for a typical residential project. As we suspected, the numbers are substantial and the environmental savings is significant. It is most certainly worth the bit of extra design and coordination time to implement. True sustainability typically lacks the sound-bites and marketing gloss that so many “green” products have developed over the years to sell more products. More often than not, the real methods of sustainability are sensible and inconspicuous. Keep both feet on the ground and cheers from Team BUILD. While each house is different, these numbers make for interesting multipliers that could be used as a baseline for similar situations. I love this. Can you show us before and after photos and floor plans? Great site by the way. You guys do amazing work. If I lived in Seattle I’d be applying to work at SPD! @ George -glad you took the math to the next level. True, we do like our per square foot metrics. @ Scot -we’ll have coverage of this project on the BUILDblog. At this point, we’re still in design development with a healthy permit review ahead of us. I am so throwing the “reuse of concrete foundations” around at the next dinner party! Thanks for the post, I appreciate seeing the math behind the decisions you guys make.